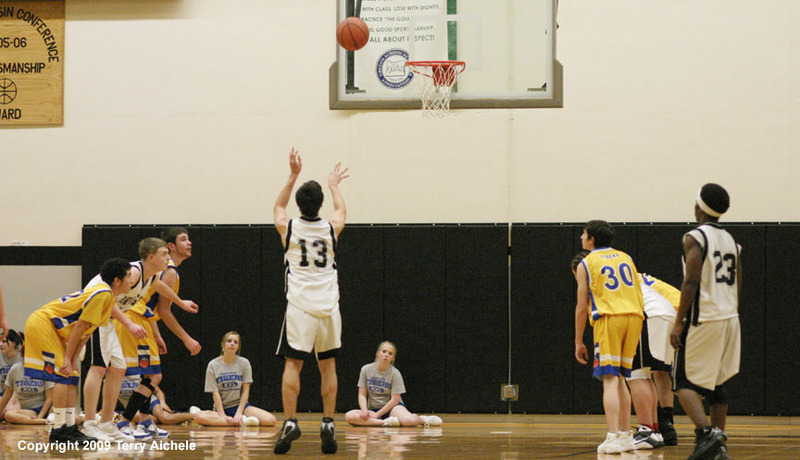 Ivan Estrada of Irrigon shoots a freethrow during the game with Stanfield on Tuesday. 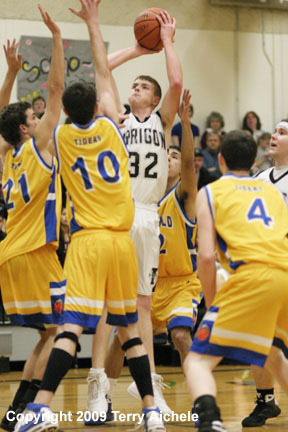 IRRIGON - The Stanfield Tigers defeated the Irrigon Knights 88 to 38 on Tuesday, February 10, 2009. Irrigon led for the first three minutes but once the Tigers took the lead they never gave it up. It was senior night for the Knights and seniors were acknowledged prior to the game. Senior Knights included Oscar Vera, Scotty McDaniel, Marquese Taylor, and Pat Barron and they were introduced prior to the game's tipoff. The Knights came storming out the gate to take a 5-0 lead in the opening two minutes of the game. Three of those points were on a trey by Dustin Osborne. Unfortunately for the Knights they were stuck at five while Stanfield scored 12 straight. Tigers scoring included Hector Esquivel, and Chase Erwert. Tigers led 16 to 9 at the end of the first period. The Tigers outscored Irrigon 23 to 7 in the second period to take a 39 to 16 score into halftime. Esquivel started off the period with a three pointer. Other Tigers scoring included Robbie Shirley, Devin Bailey, Quin Grogan, Mario Madrigal, and Erwert. Stanfield put lots of defensive pressure on the Knights during the period. Irrigon players often found themselves double and even triple teamed on the offensive end. Irrigon scorers in the second included Osborne and Ivan Estrada. The teams played a little more evenly in the third period with the Tigers outscoring the Knights 16 to 13. But the Tigers continued to pull away. There were moments that brought cheers from the stands on a drive by Pat Barron and a layup by Colton Garrett. Stanfield led at the end of the third 56 to 29. Stanfield turned on the scoring machine in the fourth with a 27 to 7 run in the course of the period. Tigers scoring included Trey Blevins, Erwert and a run of 5 points by Bailey around the five minutes mark of the fourth. For Irrigon Jesus Munoz hit a three pointer early in the period. Also scoring for Irrigon was Steven Wene and Estrada. Stanfield won 83 to 36. 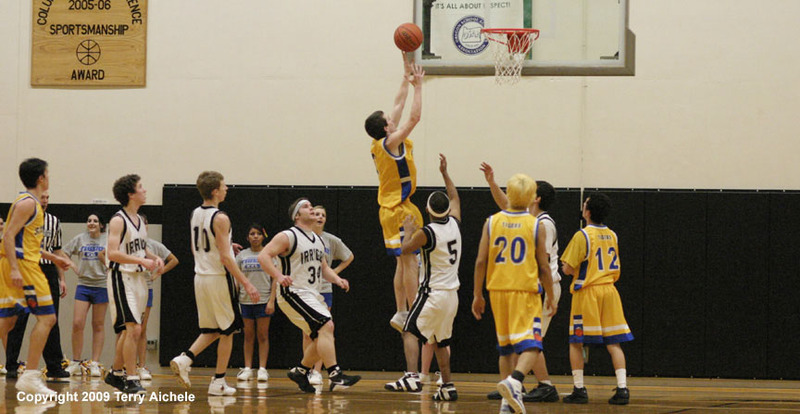 LEFT - Irrigon's Pat Barron shoots a jump shot while surrounded by three Tigers - Robbie Shirley, Chase Erwert, and Quin Grogan. RIGHT - Irrigon cheerleader Elia Cruz takes the position on top of the pyramid. LEFT - An Irrigon cheerleader performs a spinning toss during a break in the game on Tuesday. 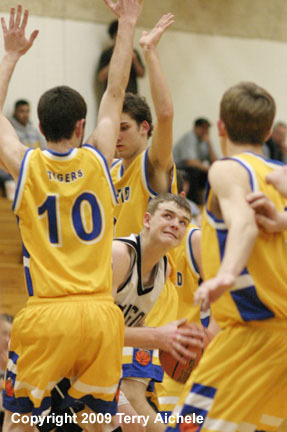 RIGHT - An Irrigon player looks for an opening while being surrounded by three Stanfield defenders. LEFT - Jesus Munoz drives to the basket while being closely guarded by Stephen Whelan of Stanfield. 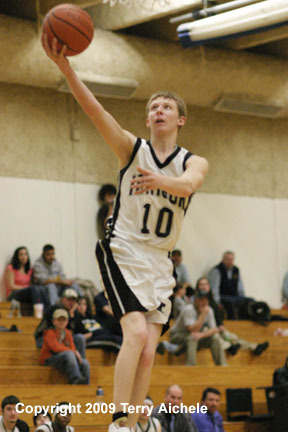 RIGHT - Dustin Osborne of Irrigon drives to the basket for a layup. LEFT - Devin Bailey of Stanfield collides with Steven Wene of Irrigon while they were chasing a ball that was going out of bounds. 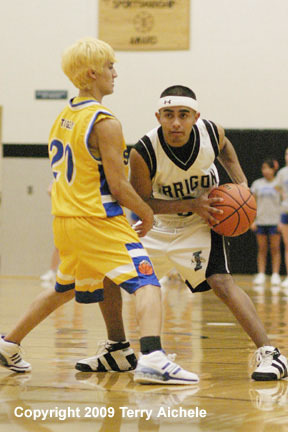 RIGHT - Oscar Vera of Irrigon looks around Kameron Watson of Stanfield for someone to pass to.